Malawi's President Arthur Peter Mutharika with VOA English to Africa reporter Peter Clottey, before their interview in New York on the sidelines of the UNGA. .
Malawi is on the road to recovery after years of drought, floods, poor crops and budget deficits, the country’s president has told VOA. This year, the economy could grow by 5 percent, said President Peter Mutharika, nearly double the 2.7 percent growth recorded last year. And the inflation rate is just over 9 percent – the first time in seven years it’s been a single-digit figure. Malawi remains one of the world’s poorest countries, according to the International Monetary Fund, with half the population living in poverty and a quarter in extreme poverty. Massive floods in early 2015 were followed by two years of drought, leaving half the population short of food. During an interview last week with VOA during a visit to New York, Mutharika said he is attempting to reverse the situation by focusing on four key areas. The first is building technical community colleges to prepare workers to open their own businesses and meet the needs of foreign companies that invest in the country. The next is to attract foreign investment. At the same time, Mutharika said, he has looked to reform the government, reduce waste and make sure the government is close to the people. Finally, he said, he has focused on rural growth – making sure the agriculture sector has the resources it needs to grow, including roads, schools and hospitals. To stabilize the economy since he took office in May 2014, Mutharika has looked to cut government spending, improve tax collection and cut government borrowing. Those efforts have paid off in terms of drawing in foreign investment. The Africa Economic Outlook for 2017 shows that Malawi’s foreign direct investment rose almost 50 percent between 2010 and 2015, to about $143 million. Mutharika said a large part of the attraction for foreign investors is that Malawi remains a peaceful country, with no internal or external conflicts. “That’s very important,” he said, “because investors when they go to a country, they look for two things; they want security and they want markets.” Malawi offers them both because it gives access to much of Africa and through agreements with the European Union and United States, to those markets as well. Mutharika, however, acknowledged his country has battled corruption, including the “Cashgate” scandal that began in 2013 when an outside auditing firm found $32 million in government funds were missing. 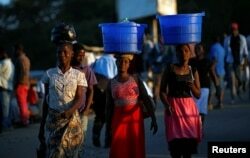 Women carry baskets with food items on their heads at a market in Blantyre, Malawi, July 10, 2017. Mutharika’s predecessor, Joyce Banda, has been charged in the case, along with several other officials. She denies any involvement and says she fought corruption during her two years in office. The president rejected the allegations of some critics who say the “Cashgate” prosecutions have been selectively focused only on opposition figures. He said he and his party weren’t in office when the money disappeared, so the focus has to be on those who were. After three years of his administration, the president said Malawi is well on the way toward easing poverty and rebuilding from some rough years. His goal for next year is for his government to have a self-sufficient budget that requires no external borrowing. This year it had to borrow 1 percent of its budget needs. “I’m very, very hopeful that with prudent spending, prudent financial management and better collection of taxes, and better foreign investment, if all the things put together, Malawi has gotten on the path to recovery,” Mutharika said.